Work more than 60 hours a week. Exercise less than 30 minutes a week. Have above average stress, weight gain, and depression. Are at high risk for heart disease. Report low morale or exhaustion. I think it’s a tragedy that many ministers who could have had long fruitful ministries are being cut down years too early because of preventable health problems. That, along with a recent stress related health scare*, is why I’m making a vow to do something about it. I don’t want to be a statistic, and even more, I don’t want my ministry to end suddenly just because I was too busy to spend time in the gym and I couldn’t resist that second helping. Bad health is not just a problem for ministers though. Remember that statistic I quoted in the first paragraph. 61% percent of the population is overweight or obese. Even if that’s not you, if you honest with yourself, you probably need to work out a little more. The church is all about helping people become spiritually healthy, but we’re supposed to honor God with our whole lives and that includes honoring God with our bodies. 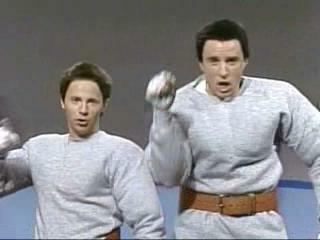 (For more about the theology involved in physical fitness, check out this post over at The Resurgence.) That’s why I’m looking at the idea of starting some kind of program for youth and a adults to help us get in shape together. No major commitments, just some accountability and encouragement with occasional times of working on this thing together. This idea is just in it’s infancy right now, but is it something you’d be interested in doing? Is your health something you’re even interested in at all? Answer the poll and leave me some comments to let me know whether or not this is something worth looking at. *I don’t want to worry anybody. Nothing serious happened, I just found out the fun physical manifestations of too little sleep and too much stress. A number of factors led to the “shortage.” You’ll see why I use quotation marks around that word in a moment. It’s true that Hurricane Ike did damage some of the Texas refineries that supply Middle Tennessee gas stations with their fuel. The pipeline that we get our gas from was operating at about 25% of it’s normal capacity so there was definitely less gas than usual coming our way. Along with that, though, one of the chief causes of the problem was panicked motorists who had heard rumors that we were about to be out of fuel and sucked up the fuel supply at almost double the rate of usual sales. Prices soared, tempers flared, and “panic buying” ruled the day. I’ll admit that I was among the buyers waiting for gas, but not for two hours, just for two cars in front of me. The station I stopped at had set a twenty-five dollar cap on how much gas one person could buy at a time, possibly to keep their doors open for longer, possibly to make sure that everyone was able to get at least a little gas. The guy in front of me in line was obviously not aware of this fact as he attempted to fill up his SUV. When the pump stopped, he stormed into the gas station and began to yell at the cashiers. I couldn’t hear his words from inside my car, but I could see the anger on his face. He made threatening gestures, threw his hands in the air, turned red, and after about five minutes of screaming (probably about the same amount time that he had spent waiting), he stomped out to his car at drove off. 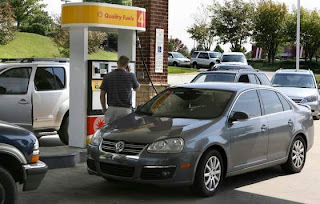 What causes people to act like this over a few gallons of gasoline? Are we so dependent on “stuff” that when it’s taken away, or at least not given to us in the amount that we want, we fly off the handle? What can we learn from a day like today? First, when rumors run rampant, things can get sticky. Thankfully this time, it was no real problem. 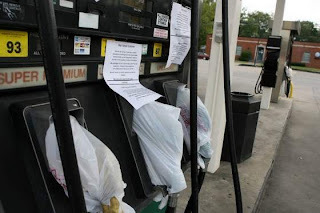 Yeah, today a lot of the pumps had plastic bags covering them, but officials say the pipeline should be back at full capacity into next week. We definitely don’t need to take everything we hear at face value and react, but that doesn’t seem to be the biggest issue of the day. All the anger and rage over having what is “rightfully ours” taken away seems to me to be the bigger problem. I understand that for a lot of people that gas was necessary, but most of us could probably stand to conserve fuel more than we do and could definitely get by on less. I also understand that the inconvenience of having to wait for hours at the pump can make drivers get frustrated, but that’s no excuse to blow up. What I don’t understand at all is why having to share with others during what looks like a potential crisis would cause a presumably normal person to have a meltdown. I think the real source of the problem is not a gas shortage, but an overage of getting what we want too much of the time. Materialism and a sense of entitlement convince us that we “need” many things that we simply want. As Americans, most of us expect that if we have the money, we should be able to buy whatever we want, whenever we want it. When we’re not able to get something we “need,” or even worse, when we have to share with others in need, well… that’s just un-American. But maybe it’s something that Christians need to think seriously about. What are we seeking first: the kingdom of heaven or the American dream? All the stuff we’ve been given doesn’t really belong to us in the first place and it’s all temporary anyway, so maybe we need to loosen up about it. I seem to remember a very wise man saying something about not serving two masters. Stuff isn’t bad in itself, but how we react to it can be bad. Do we seek after and hoard our stuff or do we see a chance to share? And entitlement? Just what makes us think we deserve any of the stuff we have? Let’s keep stuff in it’s proper place and thank God for the things we do have. Just something to think about next time you’re filling up. Yesterday as I was unloading groceries into the back of my van in Wal-Mart’s parking lot, a young man asked if he could take my cart when I finished getting everything out. I assumed he was going to use it himself and wanted to do a good deed at the same time, so I said sure. It was a hot day and that would save me the walk. That’s when I looked up and saw his dark tie, white shirt, and dark pants. He was wearing a small name tag on his lapel that said he was with the Church of Latter Day Saints. He introduced himself and I introduced myself as Jody, the youth minister at First Baptist Church, hoping that throwing around my religious credentials would dissuade him from trying to convert me. Instead, he surprised me by saying that he hoped I didn’t have anything that would melt on the way home since it was such a hot day. He told me that he was on his two year mission and that he had just arrived in town a couple of months ago. 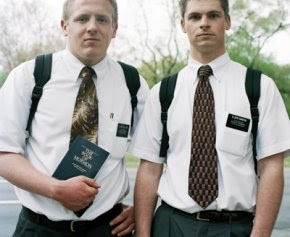 Then he surprised me even more by saying that if I ever needed any help with anything, like mowing my yard, to feel free to ask him or any of the other Mormon missionaries. He gave me a big smile and told me to have a nice day, taking my cart and leaving it in the closest cart return spot. No sales pitch, no argument about how the Book of Mormon is just as important as the Bible, just putting up a cart for someone on a very hot day. As I drove home, a couple of things struck me about this short exchange. The first was my own lousy attitude in assuming that talking with this guy would be a waste of my time and wanting to avoid any contact with him. I was so wrapped up in myself and what I had to do that I was going out of my way to avoid people who might be “annoyances” instead of seeing people that way that God sees them and looking for opportunities to show love. The second thought followed quickly behind, “I know why the Mormons are getting so many converts while biblical churches are struggling.” This guy was genuinely nice and helpful. He was friendly and didn’t mind going out of his way to help others. He was spending two years of his life not pursuing an education or trying to get girls, but going to a strange city to help put grocery carts up and share a little about his faith with others. 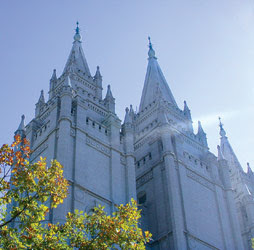 A couple of years ago, Alanna and I went to Salt Lake City and while we were there, we went downtown to the Tabernacle, the headquarters of the LDS Church. Again, I was struck by the friendliness and the willingness to take time and talk with a stranger. How does a stranger feel when they walk into our church? Are they struck by our friendliness or do they leave without being noticed? Do people take time to genuinely talk with them, or is interacted limited to a quick handshake? When people see Christians out in the world, the malls, the schools, the Wal-Mart parking lots, what impression do we give? I fear that many times, the only thing visibly “Christian” about us when we go out is our bumper stickers. When we witness, do we share ourselves and our God, or do we pass out tracts and read from a script? It makes me sad when I encounter people like this young man, first because these wonderful Mormon people are being deceived by the enemy, and most Christians don’t care enough to share the truth with them. Even worse, it makes me sad to see how much more effective Mormons are in interacting with the world than most Christians. We must be willing to go out of our way to share our lives with others and show them love. It’s inconvenient. It’s uncomfortable. But for many people, our lives and our attitudes may be the first glimpse of Jesus some people ever see. I thought all our homeschoolers would get a kick out of this. Yeah, I know there are lots of homeschoolers who are nothing like this family… but they are out there. I’ve seen them.